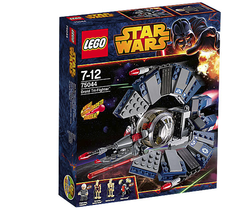 75044 Droid Tri-Fighter is a Star Wars set released in January 2014 in Europe and March 2014 in the USA. It's a new version of the 8086 set. This is a description taken from LEGO.com. Please do not modify it. (visit this item's product page) Intercept the Jedi with the super-agile Droid Tri-Fighter™! Chancellor Palpatine™ has been captured and must be taken away before the Jedi are able to retrieve him! Chase them down in the super-agile Droid Tri-Fighter™ with unique tri-wing design. When they come into range, fire the new spring-loaded blasters and release the deadly Buzz Droid™. Those Jedi won’t know what hit them! Includes Chancellor Palpatine™ minifigure and Buzz Droid™, Security Battle Droid™ and Battle Droid™ figures with assorted weapons and an accessory. This is one of the first sets to include the new spring-loaded missile launchers. Facts about "75044 Droid Tri-Fighter"
Intercept the Jedi with the super-agile Droid Tri-Fighter™! This page was last edited on 9 January 2016, at 20:54.